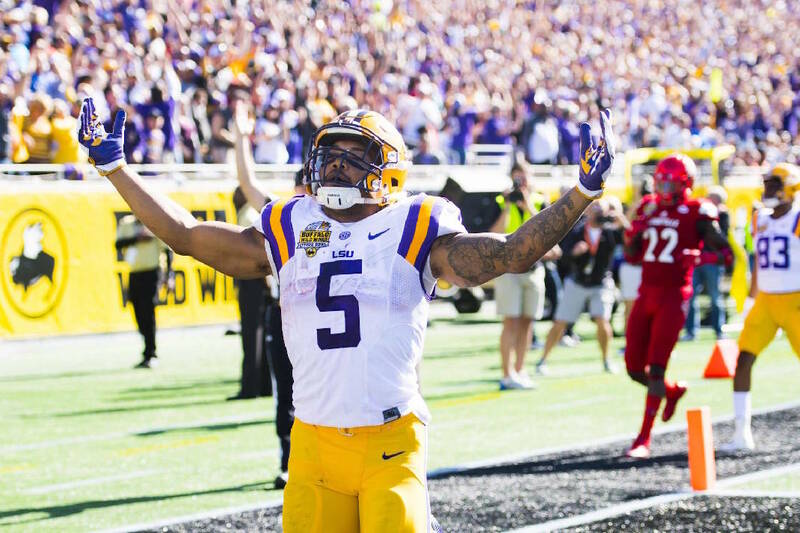 LSU junior running back Derrius Guice celebrates one of his two touchdowns in the 29-9 thumping of Louisville in last season's Citrus Bowl. If Leonard Fournette was arguably the greatest Southeastern Conference running back since Herschel Walker and Bo Jackson roamed football fields in the 1980s, then where does Derrius Guice fit in? Another big season at LSU could get Guice in the same conversation. Fournette set LSU's single-season rushing record two years ago with 1,953 yards, but his 2016 season was repeatedly derailed by ankle problems. He still rushed for 843 yards and 6.5 yards per carry, but that ranked second on the team to a healthier teammate. Guice erupted in Fournette's absence and finished last year with 1,387 rushing yards (7.6 per rush), and the 5-foot-11, 212-pound junior from Alexandria, La., enters this season believing he is just as good as his predecessor. › Fun fact: LSU has won four straight meetings over Tennessee after starting 5-20-3 in the series. The Tigers visit the Volunteers on Nov. 18. Fournette was the No. 4 overall pick in the 2017 NFL draft, getting selected by the Jacksonville Jaguars. "I don't see a difference," Guice said last week at SEC media days. "We both run angry and mean. We're both bruisers, and Leonard is fast and shifty as well. He's a power back, and I'm the exact same." When Fournette was at his best last season, which was the Oct. 22 home game against Ole Miss, he racked up a school-record 284 yards on just 16 carries. That standard barely lasted a month, because Guice amassed 285 yards and four touchdowns on 37 carries Thanksgiving night in the regular-season finale at Texas A&M. New LSU offensive coordinator Matt Canada was hired after last season by Ed Orgeron to enhance the passing game and a quarterback contingent headed by returning starter Danny Etling, but Guice is expected to be featured early and often after being chosen SEC player of the week three times last season. "I think he's going to flourish," Orgeron said. "He flourished last year in the last five or six games. He's going to have an even better year this year, and I think Matt's going to know how to use him. Matt's going to open up some holes for him. "Derrius is a tremendous player. I think he'll end up being after the season, barring any injury, one of the top players in the country — if not the top player in the country." Fournette was the top player for most of the 2015 season, but he went from Heisman Trophy favorite to longshot after being held to 31 yards on 19 carries in a 30-16 loss at Alabama. His numbers weren't much better last year against the stingy Crimson Tide as he collected just 35 yards on 17 rushes in a 10-0 home loss. Guice already is excited about his first legitimate opportunity against college football's premier program. "I've only got two career carries against Alabama so far," he pointed out. Guice also got stuffed at the goal line as time expired in a 16-10 home loss to Florida, but he insists he did not sulk over his least favorite carry of last season. "We had Texas A&M four or five days later, so I couldn't dwell on that," he said. "If I had dwelt on that, I would have had about 2 yards against Texas A&M. Instead, I almost had 300. You've got to let it go and move on to the next game." LSU has eight offensive and five defensive starters back from a team that started 2-2 under former coach Les Miles and finished 6-2 under Orgeron, capping the year with a 29-9 pounding of Louisville in the Buffalo Wild Wings Citrus Bowl. Gone are Fournette, safety Jamal Adams and cornerback Tre'Davious White, all first-round draft picks, but back are Guice and junior outside linebacker Arden Key, a potential top-10 pick in the 2018 draft. Key missed spring practice for "personal reasons" and is not expected to be available for the start of preseason camp due to his recovery from shoulder surgery. Guice, who has rushed for 1,823 yards and averaged 7.8 yards per carry through two seasons in Baton Rouge, knows the biggest difference personally this year is that he's the unquestioned star of the offense. "I don't feel like it changes anything," he said. "I'm the same Derrius that I was last year when I was behind Leonard. He's now a step higher, which is where I wish to be next, but I learned a lot from him when he was here. "He's a legend to me. He's one of the greatest to ever do it."